Be One of the Lucky Fans to Watch EXO Live in Manila with Globe! 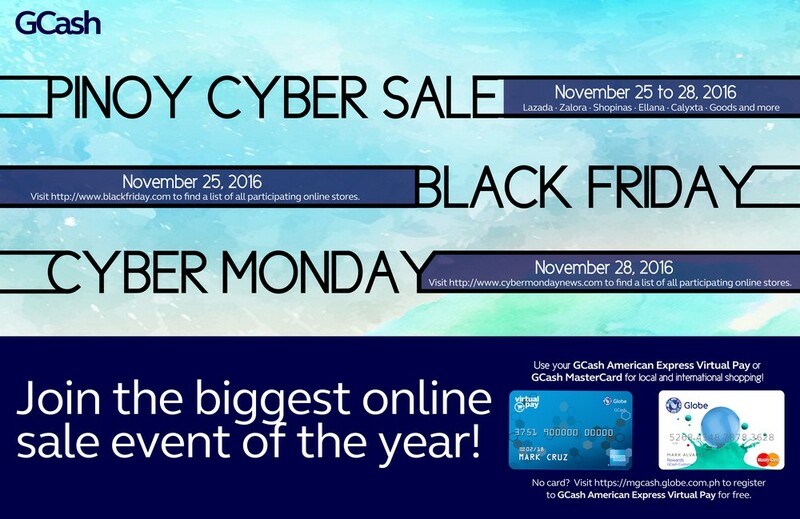 Prepare for the biggest and most highly-anticipated online sale events of the year as Globe GCash joins Black Friday, Cyber Monday, and Philippine Cyber Sale shopping madness from November 25 to 28, 2016. Take advantage of exciting promos and huge discounts from Philippine and US online. Get new clothes and shoes from Zalora, Lazada, and other top US clothing lines. Shop for fashionable gift items for your friends and family. Catch the latest gadgets and gizmos and have them delivered straight to your doorstep. Simply use your GCash American Express® Virtual Pay when shopping at US online shops from Nov. 25 to 28, 2016 and have your items delivered via My Shopping Box (MSB). New Virtual Pay users can also enjoy an additional 20 percent or a maximum of P400-peso rebate on their first transaction.
? STEP 1: SHOP. Browse through your favorite US-based online stores, pick the items you want to buy, and proceed to check-out.
? STEP 2: SHIP. Check out using your MSB and GCash American Express® Virtual Pay shipping details and have your items delivered to your Philippine address.
? STEP 3: SAVE. Avoid the hassles of having your friends and family in the US deliver the package for you, and the costs of coordinating air or sea shipments by yourself. Just shop all you want and let MSB take care of package forwarding for you. To avail of GCash AmEx Virtual Pay for FREE, simply register your GCash wallet and email address online at https://mgcash.globe.com.ph/gcashamex . Once your account is validated, you will immediately receive your Virtual Pay account details, your personalized US shipping address, and other pertinent information via email. To fund your wallet, just visit any of the 10,000 GCash Partner Outlets nationwide. Black Friday and its sister sale, Cyber Monday are the biggest sale seasons in the U.S. where many of the top online retailers and stores like Walmart.com, Amazon.com, eBay.com, Sephora.com offer products at highly reduced price, making them two of the most-awaited shopping events around the world. On the other hand, Philippine Cyber Sale is the biggest e-commerce event of the different Philippine industries. Coinciding with Black Friday and Cyber Monday, this 3-day online weekend sale provides jaw dropping deals from participating partners. Learn more by visiting http://pinoycybersale.com. Dave Stephen “Penpen” Villamora, a freelance blogger/writer hobbyist, is an Entrepreneur by degree, a Contact Agent by profession. He’s a food-o’-phile (foodporn in other term). He travels for new taste experience, a Food Traveler. He believes every food is worth to try. DavaoEagle.com is a community blog with a staff that is smart, bold and have background in web development and design, web presence optimization and internet advertising. What started as a personal blog, quickly turned into a platform, an online magazine that boasts the stories from Davao, Philippines.